One of the downsides of not having a fridge is that we are forced to process our catch quickly so within about four hours of being caught that fish was either being digested, cooling in jars after coming out of the pressure canner or gently pickling as escabeche. We had some quiet weather as we approached the Tongan chain of islands and then it picked up again as passed through the passage between the Vava’u group to the south and the Niuatoputapu group about 30 miles north of us and several shoals marked PA and ED on the chart. PA means Position Approximate and ED means Existence Doubtful – this is not a well charted part of the world so it pays to avoid anything that may be a bit suspect in its positioning on the chart and that is pretty much anything unless you are approaching a major port. My strategy in dealing with this from a navigational planning perspective is to mark up my charts (paper and electronic) with circles of uncertainty around anything that might go bump in the night. Some of the islands and reefs in that area have annotations indicating that they may be up to three miles out from their charted position. My rule, on ocean passages, is to not approach anything within 5 miles (about an hour’s sailing) if I can’t see it either with my eyes or on RADAR; therefore if an island is marked as being out of position by up to three miles I mark a red circle centred on the island with a radius of 8 NM plus the radius of the island. I mark lighthouses with a yellow circle on their reported range and sometimes the sailing directions say that a mountain or cliff will show at a certain radar range; these get a blue circle. In daylight I’ll approach closer of course but at night we keep clear of anything that we are not trying to actually get to. Here is how the chart looked in TZ Navigator v3 as we approached the Tongan Islands. 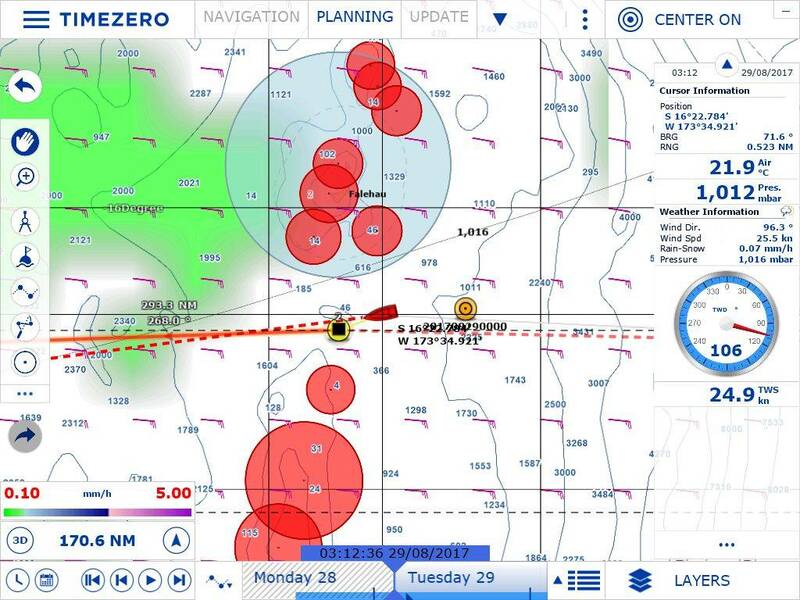 TZ navigator v3 with hazards and navigational information highlighted. 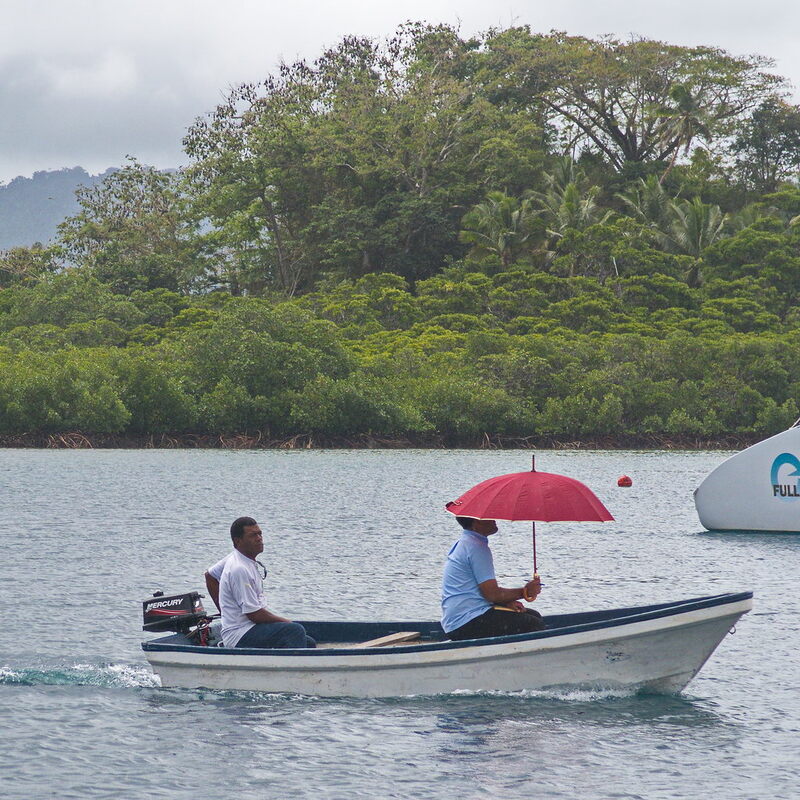 We saw a few boats on AIS as went through the Tonga groups and could listen to Radio Tonga. Their forecast was brief; a strong wind warning is in force for all Tongan waters. The wind moderated on the Fiji side of Tonga but the seas were fairly confused. About 3am at dark o’clock I was asleep and Paula was sitting in the dodger on watch when a big ole wave boarded us from the starboard quarter. The dodger cover was zipped down so no water came in but from what I heard we were under white water. The pressure of the wave on the life-ring bag attached to the guard wires was a bit much for two of the stanchion bases on the starboard side and they folded under the weight of water. One was OK but the other was a goner and has been replaced. Landfall in Fiji should have been a sighting of the light on Welagilala Island but we never saw it. Daylight revealed why we couldn’t see it, the lighthouse was no longer there; another victim of cyclone Winston ? We spent the day sailing along the coast of Taveuni Island and spent the next night motoring across the Somosomo strait and the southern coast of Vanua Levu. The wind had died so we motored along at just above tickover to make a morning arrival. Skirting around the reef we called Waitui Marina who sent out a boat to show us which mooring to take and called the authorities to come and clear us in. The weather during the voyage had been characterised by a series of squash zones where high pressure systems to the south of us had compressed the tradewind airflow increasing the intensity of the trades by a fair amount. 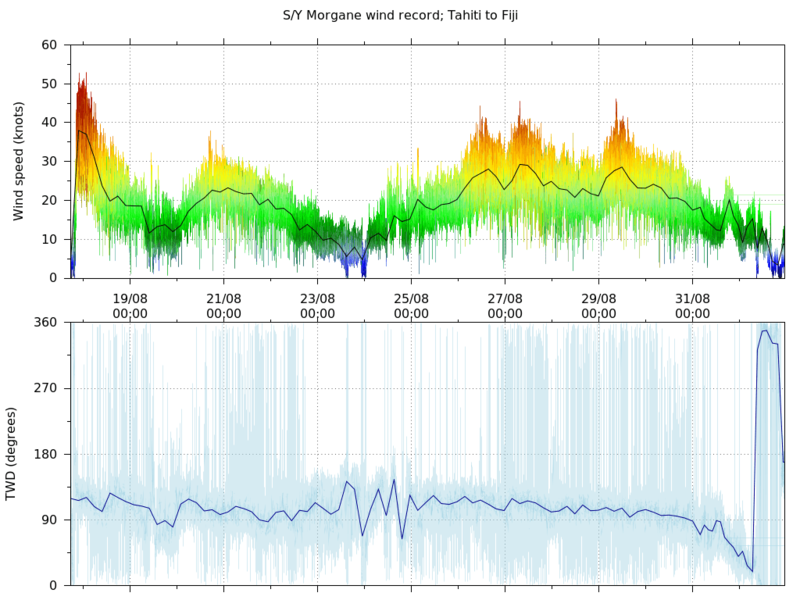 The figure below is the record of of wind speed and wind direction for the duration of the voyage from Tahiti to Fiji. We like the wind to be in the light green and yellow bands; the oranges and reds we can do without. 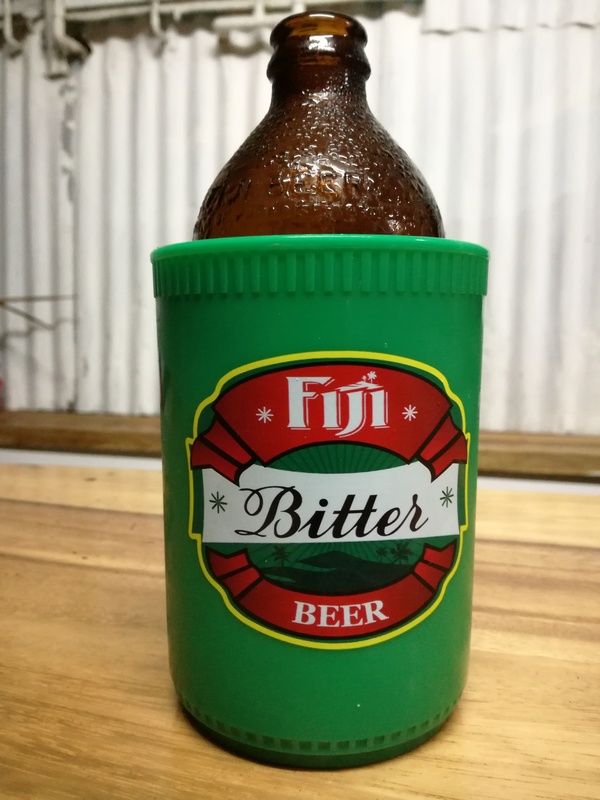 The clearance procedure in Fiji is what you might call old-school. First the sanitary inspector comes and checks that we are not carrying plague or any other nasties. There are questions on the form asking whether or not the crew have seen any signs of illness in the ship’s rat and mice populations! The sanitary inspector was a large effeminate man who was more worried about his shiny shoes than inspecting the boat. He filled in his paperwork and told me to take down the Q flag; while I was doing that he started to fuss with his papers causing Paula to worry that something was wrong. It seems there was something wrong as he made a phone call and called the person on the other end of the line an idiot for giving him the wrong forms – not our problem 🙂 Here he is being taken back ashore by the marina’s boat boy. After we given our practique the boat boy took the sanitary officer ashore and brought out the biosecurity, customs, and immigration officers. They insisted on doing their paperwork on the saloon table rather than on the little table in the cockpit. Now the biosecurity lady was a big girl and we didn’t think that she would fit between the couch and the table but she squeezed her way in and the other two slipped in alongside. It was a hot day even for the locals and they hadn’t been inside for long before the biosecurity lady started to melt. She asked if we had any fans, we have a couple of portable ones but the batteries were flat so Paula frantically dug out some batteries before we had puddle of molten biosecurity lady on the cabin sole. There was a long biosecurity form to fill in which required the lady to list the locations of all of our stores. Paula told her that we had potatoes and she asked where they were stored – well they are stored behind the sewing machine; it’s a cool(ish) dark place which keeps the captive and stops them going green – she wrote down “potatoes – stored in pantry”. The customs officers interview consisted of an interrogation of our knowledge of the latest Super League rugby results. Luckily we had been to a game that he was particularly interested in (Crusaders v Hurricanes) just before we flew to Tahiti so were able to pass the test questions. The immigration lady was careful to check that we knew what was required to ensure that we could travel back to Fiji on one-way tickets from New Zealand as we explained that we were leaving the boat for a few weeks to return to Christchurch on work commitments. All in all a very helpful bunch. The next day we had to go around all the relevant offices in town to pay the bills. I think immigration was free but we had to pay fairly substantial fees at all of the other offices. We had fun at the biosecurity office as the officer there who appeared to have some kind of social disability didn’t have any change. It was a tiny amount of money but he wouldn’t not let us go without giving us the correct change despite us insisting that 25 cents wasn’t worth worrying about. At one stage he grabbed my wallet and rifled through it looking for Fijian bills of the correct denomination only to find some NZ currency; which totally confused him. He then sent me out to a nearby bakery, to split a 100 dollar bill, with strict instructions to buy two cream buns ( I disobeyed and bought a sliced wholemeal loaf ). On my return I found that he had asked Paula what she did and upon finding out that she was a Dr. of biology pulled out his phone and asked her to identify a caterpillar that they had found in a container aboard a recently arrived ship. He had no idea what it was except he was sure that it was an insect and a pest and that the whole ship would have to be fumigated (fair enough really). Cheers guys, thats a cool blog post, rob.